As a nutritional therapist and the owner of a health store, I find that cholesterol management is a subject that comes up regularly among my customers. Some have been prescribed statins to manage high cholesterol and want to find natural alternatives. Others have been given borderline results and are looking to change their diets. Cholesterol has many functions in the body. It is necessary for converting sunlight to vitamin D, it is needed for mental function and it is needed for exercise recovery. Those are its three main functions in the body. There are two types of cholesterol: HDL and LDL, which stand for high density lipoproteins and low density lipoproteins. HDL is known as “good” cholesterol and LDL is “bad”. There is also VLDL, which stands for very low density lipoproteins. This a type of so called “bad” cholesterol because it can adhere to the arterial wall. The general consensus is that a healthy overall cholesterol level should be between 3 and 4.5 mmol/L. Raised cholesterol can lead to an increased risk of cardiovascular disease, which is why many people who have high cholesterol are prescribed statins by their doctor. Statins are famous for depleting coenzyme Q10 which is why I would always recommend that anyone taking them also takes a coenzyme Q10 supplement. This can help to reduce the absent mindedness, the possible loss of memory, muscle soreness, weakness and fatigue that are among the side effects of statin use. Statins also deplete vitamin D and selenium. So if you’re going to have to stay on a statin for any length of time it’s worth supplementing with coenzyme Q10, vitamin D and selenium. Research has shown that a plant-based diet can be as effective as taking a 20mg statin. Not everyone wants to make that leap, but if they are prepared to then it can go a long way. If people want to persist with a cholesterol rich diet, then evidence suggests that adding garlic and/or onion to a cholesterol-rich meal halves the post meal increase. If you don’t like adding garlic to your food, then a good quality garlic extract can be very effective. Turmeric also helps to regulate cholesterol, whether in powdered or fresh form. Add in some black pepper when using turmeric and this will help with the absorption. Oats, particularly traditional oat bran, are quite effective at lowering cholesterol due to the beta glucans they contain. Other things that can help with raised cholesterol include plant sterols, which help to reduce the absorption of cholesterol; red yeast rice, which reduces the production of cholesterol; and probiotics, which help with the excretion of cholesterol. Vitamin C is another inexpensive but effective way of keeping cholesterol under control. I would recommend taking 3g a day – 1g with each meal. Exercise does seem to improve the cholesterol profile. Research on mixed martial artists found that those with high levels of LDL cholesterol recovered faster from hard exercise. So although we tend to look at it as “bad”, LDL cholesterol does have a function in the body. Other general lifestyle advice includes limiting your alcohol consumption as excess alcohol can elevate cholesterol significantly. Smoking is another big no-no as it damages the cholesterol itself which then leads to damage to the arterial wall. If you are looking for advice on how to manage your cholesterol levels naturally then your local independent health store is a great place to find advice and help. 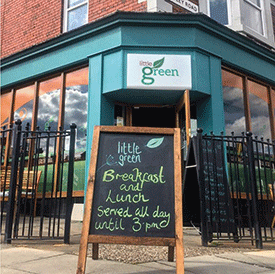 Little Green is a brand new, family-run vegan café, health food store and social space based in Sandyford, Newcastle, which opened in June 2018. The café offers homemade, nourishing vegan foods using, wherever possible, locally sourced, organic produce. It also stocks a wide range of local craft ales, cocktails, coffees, smoothies, protein drinks, raw desserts and more. The health food store stocks a range of vitamins, supplements, chilled and frozen foods and much more. Gareth is on hand to offer advice, one-to-one nutritional consultations and food intolerance tests. Little Green Social is also a refill station for detergents, shampoos and conditioners. To contact the store, visit www.littlegreensocial.co.uk or call 0191 230 5167.